Building Regulations exist to ensure our buildings are safe, energy efficient and accessible for everyone who uses them or lives or works in and around them. Building Regulations apply to most new buildings and many alterations of existing buildings, whether domestic, commercial or industrial. In England and Wales Building Regulations are made under powers provided in Section 1 of The Buildings Act 1984 (as amended by the Sustainable and Secure Buildings Act 2004). The current regulations which set the building standards and requirements are contained in the Building Regulations 2000 (as amended). They contain various sections dealing with definitions, procedures and what is required in terms of technical performance of building work. These performance requirements are split into 14 parts in Schedule 1 of the Building Regulations 2000 (as amended). These parts deal with individual aspects of building design and construction – from Part A (about structural matters) to Part P (about electrical safety in dwellings). Building Regulations don’t tell you how to build – they set broad functional requirements. Official guidance on how the Building Regulations might be met is given in a series of Approved Documents, but there is also much more technical guidance published elsewhere which provides information on how the Building Regulations might be met. There is rarely, if ever, just one way to meet a regulation. Click here to read more about Building Regulations. The planning process is designed to guide the way our towns, cities and countryside develop. It covers the use of land and buildings, aesthetics, landscaping considerations, highway access and the impact that the development will have on the general environment. Building Regulations, on the other hand, set standards for the design and construction of buildings to ensure the health and safety of the people who use them and encourage energy efficiency and access for all. For many types of work, both planning permission and building control approval will be needed. For other building work, such as internal alterations, Buildings Regulations approval will probably be needed but planning permission may not be. If in doubt, contact a local ACAI member for advice. Who is responsible for obtaining approvals? With all building work the owner of the property (or land) is ultimately responsible for complying with the relevant planning rules and Building Regulations. Failure to comply with the relevant rules results in the owner being liable for any remedial action, which could go as far as demolition and/or restoration. The general advice to architects, clients and contractors is to discuss your proposals with your Approved Inspector before starting work. When do I need to get Building Regulations approval? Alterations involving work that will temporarily or permanently affect the ongoing compliance of the building in relation to its structure, fire or access to and use of buildings. When installing replacement windows using a builder or window company not registered with a relevant Competent Persons scheme. The installation of a service or fitting, which is controlled under the Regulations. Competent Persons schemes were introduced by the Government to allow individuals and businesses to self-certify that their work complies fully with all relevant requirements in the Building Regulations. Competent Persons schemes are now major players in the building control market. However, this concession is strictly limited to specific types of work such as electrical installations in homes, heating, hot water, air-conditioning and ventilation, replacement windows, toilets and showers – typically areas where the level and incidence of risk is low. The works must meet current relevant technical standards in the Building Regulations and they must not make the building dangerous or less compliant than previously. For instance, replacement double-glazing must not lessen compliance with requirements for escape from the building, or prevent adequate air supply for combustion appliances and their flues and ventilation for health considerations. Competent Persons schemes are run by organisations which can show they have the necessary technical, managerial and financial ability to secure compliance by their members, and can deliver robust monitoring and audit regimes. Who takes enforcement action if Building Regulations are not met? Under the current system, if work is found not to comply with the Building Regulations, only the local authority can serve an enforcement notice on the building owner under section 36 of the Building Act. This notice would require the alteration or removal of non-compliant building work. It must be issued within 12 months of the date of completion of the non-compliant work. A local authority can also apply to the court for an injunction to stop seriously dangerous work, and can take criminal prosecutions in the Magistrates’ Courts for flagrant breaches of regulations or for persistent offenders if such contraventions are caught within six months. What enforcement powers do AIs have? Unlike a local authority, an Approved Inspector has no formal powers to enforce the regulations. Where work under an Approved Inspector’s supervision contravenes the Building Regulations, a written notice may be issued. If the work is not then remedied within three months, the Approved Inspector will refer the work back to the local authority for them to take action. About 1% of AIs’ projects end up being reverted to local authorities for enforcement each year – which is about the same as the percentage of local authority jobs that result in enforcement action. How does an Approved Inspector satisfy him/herself that construction meets the required standards? An Approved Inspector is required by law – regulation 11 of the Building (Approved Inspectors etc.) Regulations 2000 (as amended) – to take such steps as are reasonable, within the limits of professional skill and care, to ensure that regulations are met. What constitutes ‘reasonable steps’ is not specified in Part II of the Building Control Act 1984 but Building Control Performance Standards give a guideline. Inspections of work at identified stages are agreed at the outset when designs are approved. Do Approved Inspectors inspect all the building work? No. Building control is only about work covered by the Building Regulations. And even then, it is recognised that it is not practicable to examine every item of work covered by the Building Regulations. Approved Inspectors are required to use professional skill and judgement in their selection of priorities for inspection and avoid unnecessary inspections of low-risk stages. At present local authorities are not required to carry out any inspection at all, but the Government is encouraging all building control bodies to adopt this ‘risk-based approach’. How much does it cost to use an Approved Inspector? This is a matter for negotiation between the AI and the client. Approved Inspectors recognise the need to offer a competitively priced service that represents value for money. Fees are based on the services the Approved Inspector carries out for you. You should contact an Approved Inspector for a quote for your specific project. 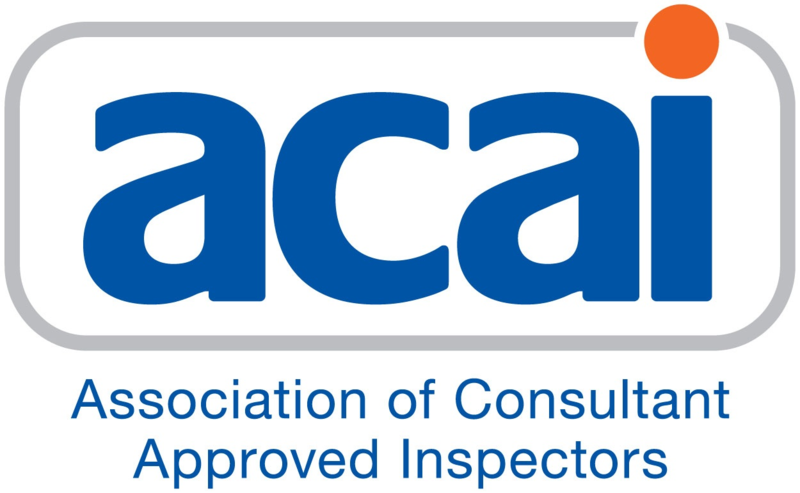 Approved Inspectors are certified by the Government’s designated body, the Construction Industry Council (CIC). Once you have been certified by the CIC, you can then apply for membership of the ACAI. On receipt of an application the CIC registrar checks for gaps in experience or qualifications that may block the application or cause delays later on. This check may involve seeking clarification from the applicant or others. The applicant then becomes a candidate for Approved Inspector. A panel of professional assessors consider the application to determine whether the candidate has demonstrated the necessary experience and knowledge to merit an interview. Candidates are called for a professional interview before a panel consisting of three expert assessors assisted by the CIC registrar. This is the final stage of assessment and is an opportunity for candidates to demonstrate their knowledge and experience, expanding on the information provided in their application. Following successful completion of the Approved Inspector application process, the candidate is invited to register as an Approved Inspector. Approval lasts five years, after which AIs must reapply and undergo the same process. Click here to visit the CIC website for more information and application forms to become an Approved Inspector.